The film illustrated how Huerta remains one of the most impactful, yet overlooked, giants in American civil rights history. Huerta’s work is often misattributed to Cesar Chavez, with whom she co-founded the United Farm Workers union. For example, it was Huerta, not Chavez, who created the “Sí se puede” chant later used by Barack Obama as a campaign slogan in his successful 2008 presidential bid. Huerta’s accomplishments reflect this conviction. Throughout the years, her activism helped improve labor conditions for Latinx farm workers through better safety regulations, sanitation, and accessibility to drinking water and bathrooms, as well as the termination of the use of some toxic pesticides. 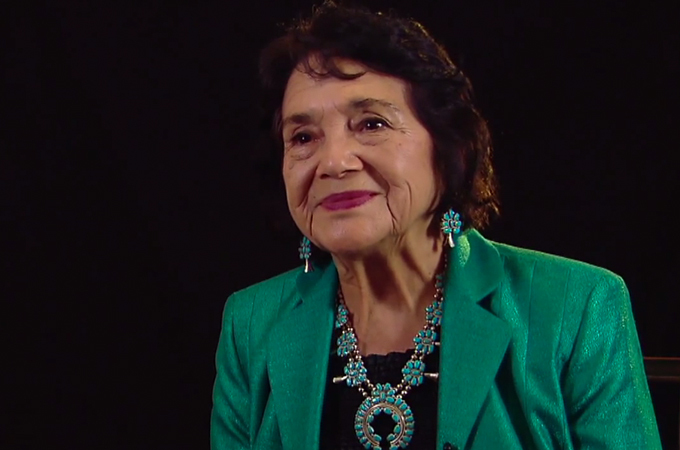 Today, as founder and president of the Dolores Huerta Foundation, she continues her work to develop leaders and advocate for the working poor, women, and children. During the question-and-answer session, one man stated he was from the Central Valley and, with tears in his eyes, thanked Huerta for improving conditions at his job. Pineda went on to ask Huerta what advice she would give to Pineda and other first-generation students and children of immigrants. 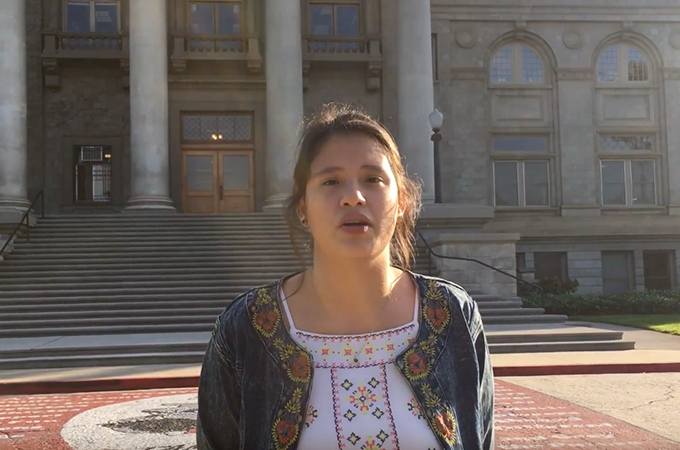 ”I think that you, and people like yourself, are going to save this country,” Huerta responded. “There's going to be a tsunami of young people who are going to go out, organize, do what you're doing, recruit other young people. As I said today, please get involved in the elections that are coming—that's a really important thing for you to do." The event was sponsored by the Esri Forum, Town & Gown, Campus Diversity and Inclusion, the Office of Alumni and Community Relations, and a variety of academic departments. Learn more about upcoming events at the University of Redlands.